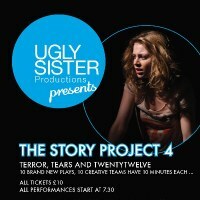 I was thrilled to work with Ugly Sister Productions for a second year in The Story Project 4; Terror Tears and Twenty Twelve. The production was a showcase of new writing where ten writers and ten directors had just ten minutes to grab the audience’s attention. I played Alex, a pushy and self-obsessed American model in darkly comic scene, Legacy written by David Lane and directed by Chris Lince. The piece explored the relationships between disconnected siblings who came together over the death of their mother. Performances were at The Arcola, Theatre 503 and Southwark Playhouse. And yes, that’s me on the promotional flyer!